I loved the sketch and used images I stamped with visiting Sue this past weekend. If I had time, I would have added some butterfly wings behind my image - but as it was, I was running late. I still may do that when I'm done with this post. The image is stamped twice on Watercolor paper, the 2nd image was cut out and Watercolored, then popped on dimensionals over the first. The lovely pattern paper is from Prima. To finish off my card, I misted with Ranger Perfect Pearls Mist. Hey Crafty friends - If you have cards sitting in boxes, looking for a good home, Traci is running a card drive to raise money for the American Cancer Society. See the sidebar on her blog for more details! Thanks! She is so adorable! I never thought of adding wings to people and things like that! You are so creative. I love the colors you used, and that dp is Fabulous! Thanks for the Card Drive Mention! I appreciate that! But, I really appreciate YOU for doing it! Sweet success, luv the wings! Beautiful card GF!! 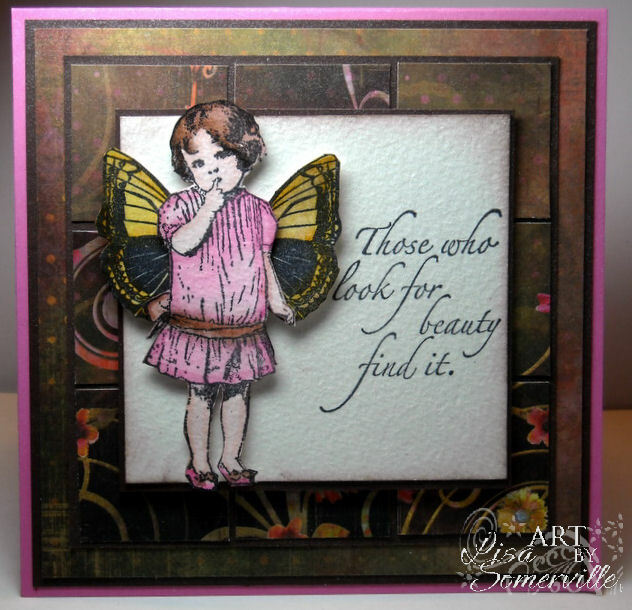 I love little Betsy, she is one of my favourite stamps and love what you've done with her. Fab card. Oh I am behind. Love this image and she is sweet with wings and without. Beautiful coloring and love the grid card behind her. Lovely card! Lisa! 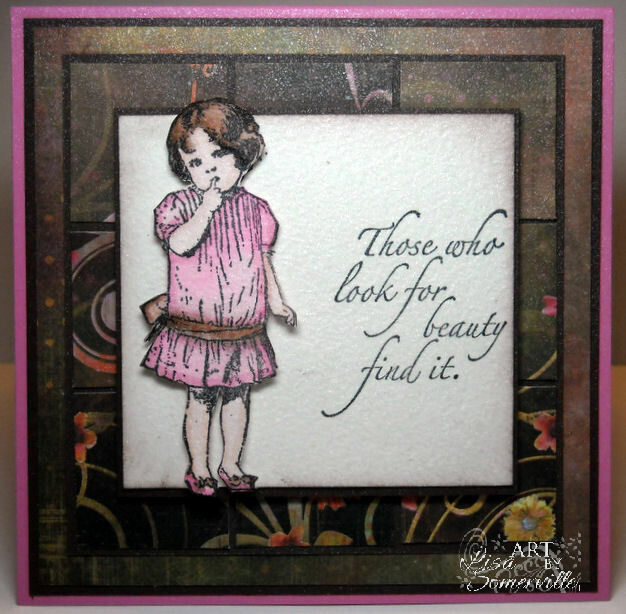 I love the image of this sweet little girl and what a lovely card this is. Hope all is well with you. What a sweet card, that little girl looks adorable with or without wings (but the wings are fabu), very sweet. Beautiful work. darling card, Lisa...I love the wings!